Michelotti’s radically-restyled body on a widened TR3A chassis so frightened American dealers that they ordered another 3000-odd TR3As for 1962 instead. Everyone else took well to the sharp modern lines, though there were a few purist mutterings about it having gone soft, what with the wind-up windows and face-level air vents (the first British car to have them). Other benefits included rack and pinion steering, all-synchro gearbox and an extra 150cc in engine capacity. 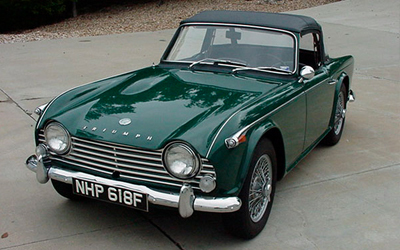 From 1964 the TR4A was more of the same, but with independent rear suspension.